Marina Ramirez is a young woman with a vision…an Olympic vision. 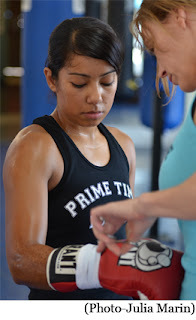 SACRAMENTO, CA -- With lightening speed, Marina pounds the punching bag as if to knock it from its hook at the Prime Time Boxing gym in Sacramento, California. Anyone standing close by can feel the power punches in the stomach that the number 2 nationally Ranked boxer lands on the bag. Stepping back, she pauses, looks at us, and flashes the smile of a pretty and shy girl. Marina Ramirez is a young woman with a vision…an Olympic vision. At five-foot even and edging 112 pounds, her 4-hour daily training and hard-body tells you she means business. Her goal? To make the 2012 U.S. Olympic Women’s Boxing Team. So what motivates the 21-year old to become a boxer? And, she’s convincingly believable in the ring. Born in the small community of Parma, Idaho, about 30 minutes outside of Boise, Marina grew up as an outdoor girl, riding horses (even a bull) and an athlete (running cross-country and playing basketball.) But, it was getting bullied that drove her to learn how to box. Interestingly, the soft-spoken Latina does not pass as the image of a boxer, especially that created by other women boxers like Laila Ali, who has been inspiration for Marina. In fact, if anyone met Marina in the street, they would see her as a pretty and feminine young girl, unsuspecting of her real skills and power-punching abilities. “I took karate, but I really like boxing,” she remarks. 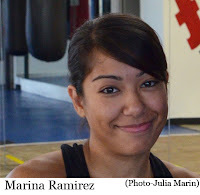 Helping Marina in her corner is Cary Williams-Nunez, who is one of only three women in the nation trained to coach Olympic level boxing for women and owner of the Prime Time Boxing gym in Sacramento. 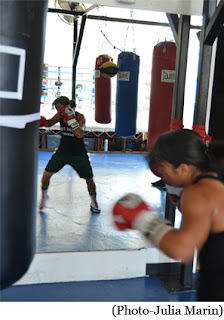 Women’s boxing was added to the 2012 London Olympics by the International Olympics Committee, giving legitimacy to the sport, which has had limited exposure having been limited only to the professional ranks. Marina won her first amateur fight, which gave her additional motivation to continue and has since collected 30 fights, raising the eyebrow of the U.S. Women’s Olympic Boxing team coaches. “My parents and my friends support me, and that’s very important to me,” says Marina, also sharing that she owns a horse back in Parma where her parents live as well. Upon turning 18, she moved to Las Vegas, seeking better training and an opportunity to be more competitive. 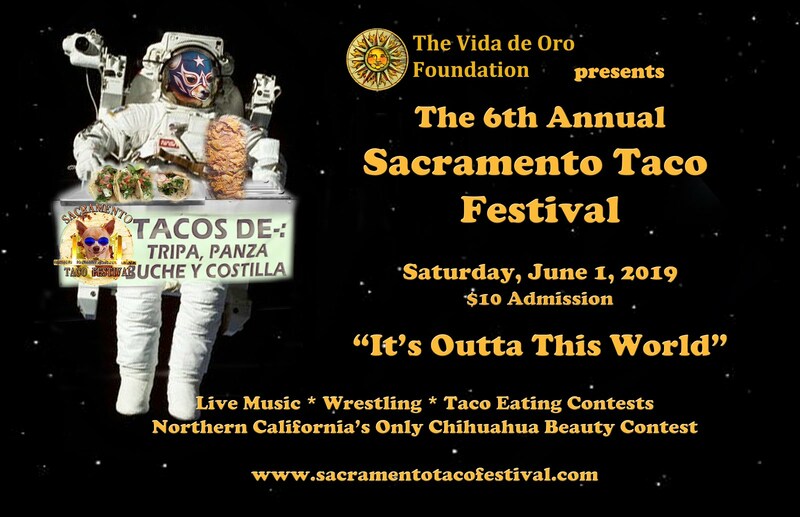 It was here where Cary saw Marina at an amateur tournament and asked if she wanted to train at her Sacramento gym. Spending a week at Prime Time Boxing has helped sharpen Marina’s skills preparing her for the Golden Gloves. "Team Marina" are still seeking sponsors. 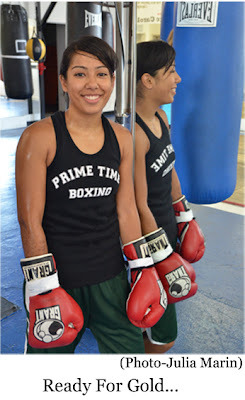 Follow Marina’s career through www.primetimeboxing.com Facebook page.